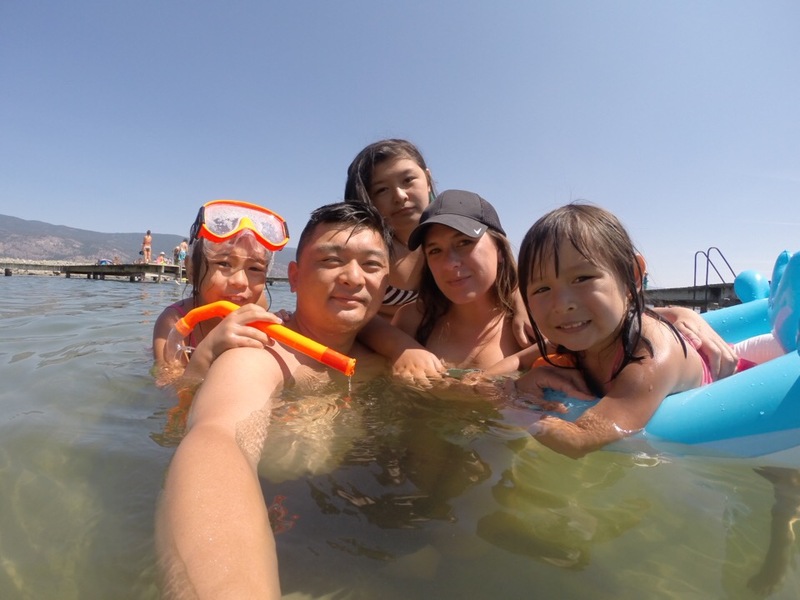 Recently our family went on a trip to Summerland BC and I wrote about our mini getaway here. However, I only wrote one side of the story. At the time, I couldn’t get myself to share what I truly wanted. I needed time. It was so easy to write a quick blurb and add photos. It’s never hard to share the highlight reel. So that’s what I did. I wrote a quick post highlighting our trip and I skipped out on what I truly wanted to articulate. I wasn’t ready. I didn’t even know how to put what happened on our trip into words. The night before the incident occurred, I was laying in our stuffy tent, on an almost flat air mattress with our 4-year-old daughter sandwiched between my husband and I. I could hear the sound of the creek next to us, the crickets, and my husbands loud snoring. I lay awake lost in anxious thought, twirling my hair around my finger in circle after circle. I was annoyed that my daughters feet were jammed into my back, so I tried pushing her over several times, but every time I pushed her away, her legs somehow ended up in the same place. I shook my husband once or twice to try to get the loud annoying snoring to stop. My attempts were hopeless, so I went back to trying to sleep, but my anxious brain wouldn’t let me rest. I thought of moving outside of the tent and sleeping in a chair but I was scared I would get eaten alive by mosquitos. I could hear our eldest daughter and her friend in the tent next to us, laughing uncontrollably. I felt annoyed they were still awake. I’m pretty sure I was annoyed with everything, my thoughts in particular. I woke up the next morning with bags under my eyes in desperate need of coffee. My kids and husband were already up. I could hear their chatter outside the tent, and as soon as I unzipped the tent my husband had a coffee ready for me. He handed me the coffee as I proceeded to tell him about my horrible sleep, and crazy thoughts. He sat there and listened for a bit and then he gave me crap for worrying about such silly stuff, and told me to just enjoy the vacation. Shortly after breakfast my husband and I went in the lake to take some photos together on my sisters instagram worthy donut floaty. In our attempts to both try to get two bodies into the one hole we laughed pretty hard. We quickly realized this wasn’t going to work, so I lay solo on the floaty while my husband stood beside me and took photos of us with his go pro. The stress from the wind was causing a current in the lake which pushed me away in the donut quite rapidly. I began to worry I might go to far, so I wiggled my way out of the donut. While I wiggled out, the donut floaty slipped beneath me. The wind kept pushing the donut away and once I realized it was so far out of reach, I started to swim back towards the shore. I didn’t feel comfortable swimming where I couldn’t stand, and I had flip-flops on my feet which made kicking difficult. I didn’t want to lose the only shoes I brought! My husband on the other hand, was pissed that I gave up on saving the donut floaty and attempted to go after it himself. From the shore, I watched as he swam towards the floaty and then just like I did, he realized how fast the current was pushing the floaty so he gave up. Once I saw him swimming back I decided to go back to where the kids and family were hanging out. As I was walking back, I glanced over at my husband and noticed he was walking along the beach. He walked along the shore, watching the floaty get pushed further and further away until I couldn’t see him walking or the floaty in the water anymore. I told myself he was probably hoping someone would see him looking for it and would somehow get it back. About 15-20 minutes later, my uncle decided to go for a walk to see where my husband was. Our middle daughter decided to go with him. Within 5 minutes I noticed my uncle walking back solo. He came back and calmly said, “Charles was rescued, he needs water.” I was so confused. Rescued? Did he mean the silly $15 donut floaty was rescued? I walked behind my uncle and followed him towards my husband. He was laying under a tree, with his hands and legs sprawled out on the grass. Our daughter was sitting beside him, her face looked sad, mad and confused. I was in shock when I saw him. What the hell happened? My husband went back in to try to save that stupid floaty. I gave up on it the moment I realised my life was more important to me than a floaty. But my husband, he’s always thinking of others. He knew how much my sister loved that thing. So, he walked into the water towards the floaty, until he could no longer stand, started swimming towards it and the current kept pushing the floaty away. He over estimated his swimming skills and once he realised how far out he was, he began to panic. He said the waves were strong and he kept swallowing water, and then he said he thought of me and the kids, and yelled twice for help. He said he thought his life was over, and doesn’t remember what happened after he saw two guys coming to save him. All he remembers is being pulled up on a boat, feeling a bit incoherent. He said they asked him a few questions, but he doesn’t remember what they were, and then they dropped him off on the side of the beach. After we walked back to the cabin, my husband needed to rest. His muscles felt tense, he was dehydrated, and exhausted. We gave him lots of water, sat with him for a while and then he wanted to stay behind and sleep while we went to the beach. My husband came walking towards us, and my daughter ran towards him. She gave him a hug and then asked if he had a band-aid. Her toe was bleeding from scraping it on the cement the night before. They walked away together, holding hands toward the bathrooms to see if someone had a band-aid. I watched them walk away hand in hand, as my eyes welled up. I could have lost my husband, my best friend. The person I’ve been with for over 13 years. The girls could have lost their father. Everything I was stressing out about the night before in the tent suddenly became irrelevant. My brain would not stop obsessing about this business and ways I need to improve, change and make it better. Some of my thoughts sounded like this: I need inspiration. I need time to work. I need a new website. I need a fancy camera so I can post professional photos. I need a different logo. I need more followers. I need an e-book. I need, I need, I need. Sadly, all these “I need” thoughts, resulted in me feeling like this work I’ve poured my soul into isn’t enough. I felt anxious, but above all, I felt frustrated. I was frustrated because I knew I was being hard on myself, and losing site of the reason I even started my blog in the first place. I started my blog to inspire others to focus on what counts, and I was losing focus. Wanting what I have counts. And most importantly, love counts. If I could go back to my anxious night in the tent, I would pull my husband in closer and listen to him snore instead of nudging him. I would turn around to stare at my daughter, and wipe her hair out of her face, instead of pushing her away to get her feet off my back. I would smile when I heard my teen daughter laughing uncontrollably in her tent, instead of feeling annoyed and I wouldn’t think about the things I need, instead I would think grateful thoughts of things I already have. These faces right here, they’re all I need and they’re my inspiration to never give up on my dreams. Ps. If you don’t think you’re a great swimmer, take lessons! I’m making my husband wear a life jacket from now on!!!! What an incredibly frightening experience. I am so thankful your family is safe. Such an eye opener when things like these happen. Thanks so much for sharing, Jamie. Great read as always and perfectly written. So glad everything is OK. You are so beautiful lady, thanks for being so raw and deal. Much much love! I’m sorry to hear that Jaime. That was scary and thank God your husband was ok. Often times we are too busy to miss what the most important thing in our life, that’s our family. I love this quote from Joel Osteen, “this pain is not here to defeat me, it’s here to promote me”. All these that you have gone through has made you a stronger and better person. Oh Jamie! How scary. I am so glad he was rescued and is now safe and sound. You always make me reflect whenever I read your posts. I’m happy to hear your hubby is ok. It’s true sometimes we sometimes get caught up in all the things we could do better but forget the real reason why we started doing all this. I’m the same way! Thanks for always being candid and sharing so many real moments of life, especially the ones that count. Thank you for so honestly and emotionally sharing your story. The same thing could’ve happened to any family when they’re on their vacation and the outcome could have been so much different. Isn’t it interesting how it always takes a threat of what have being taken away from us to make us wake up and realize what we DO have. Thank you for the reminder because now it’s making me think about the same. Thank you for reading. This experience really did wake us up. We are so grateful.